Our legal team at Graf Coyne has practiced together for many years. Bill Graf and Mark Stiebel became partners in 1994 and have attracted a team drawn together by shared values and a common vision of how our clients should be served. Our vision and goals are described in Our Values and Our Mission statements to which we all subscribe. Our firm was established so that we, and others who share our vision, can serve clients through the practice of law without distraction or interference from competing interests. Most of our attorneys have practiced at other firms, some at very large law firms, and prize our collegial and client-centered working environment. We believe that the size of our firm both facilitates the development of close, long-term client relationships and encourages individual responsibility and accountability to others. Similarly, the firm has restricted its practice to fields of the law relating to privately-owned businesses and the development, maintenance, and protection of personal wealth. Our goal is to serve all legal needs our clients may have in these areas at the highest standard, not to become a full-service firm that holds itself out as offering all things to all clients. The complexity of many of our practice areas, particularly as they relate to taxation, requires a depth of knowledge and continuous study of the law that would not be possible if we were to divert time and resources to other fields. However, we develop and maintain relationships with top attorneys outside of the firm who are experienced in matters we do not handle and we will readily refer our clients to other trusted legal counsel as the need arises. 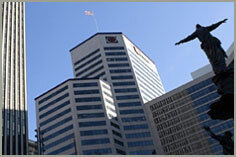 Our offices are located in the core of the central business district directly across from Fountain Square and within walking distance to the sports stadiums, The Banks, and other downtown attractions.